The Times They Are A Changin’ | Great Escape. Nick Bullock. 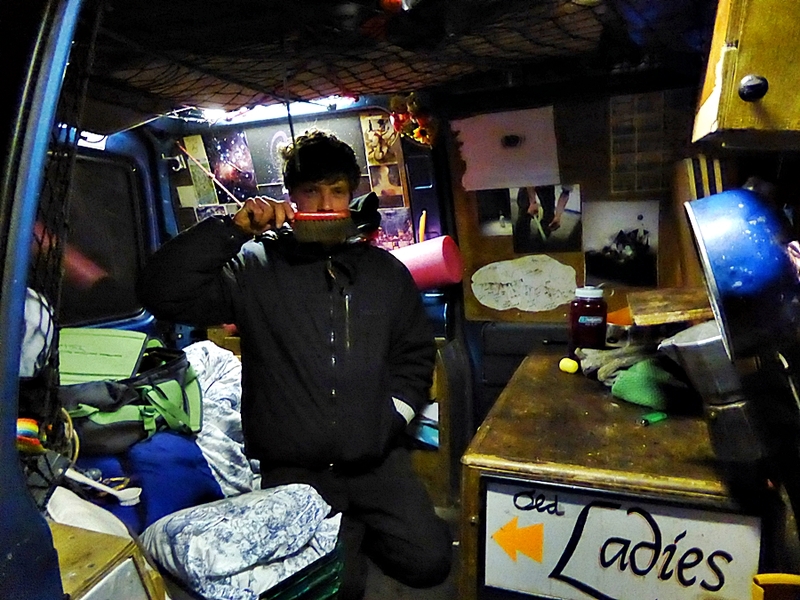 Ricky Bell, a ,man with a big moustache, a van with character and the ability to hold hard and pull down. No change necessary! For approximately twenty years I have climbed rock. And after this time you would think nothing new could be learnt. In reality, the opposite is true, especially for someone who did not ‘pull-on’ properly until his thirtieth year. I had a good grounding. I began weight training aged nine and at the age of eleven, I became a gymnast. Years later, I benefit still from both of these activities. Muscles, joints, nerves, neurological pathways hold-on – hold on like fingers gripping small edges – my body clings to movement instilled from very young. Automatic, it’s like hitting the keys of a computer and watching the words move along the screen. In my time, I have shared overhanging and slabby, walls and caves and corners, cliffs, some clean and some not so clean, cliffs formed of Rhyolite, Quartzite, Dolerite, Slate, Shale, Mudstone, Limestone, Quartz and Granite with Seabird and seal and Pippet. I have also shared the same cliffs with many top-end rock climbers and almost all, without exception, have started climbing from a young age. Over and over, I witness a flick of the switch, they change into a bird of prey; eyes spot formation which transfers immediately to brain. Brain sends information to the joints and muscles and a conditioned body strikes. I pay out rope in admiration and awe. Twist, turn, stoop, press, tighten, strike, relax, extend, flex, contract. More often than not, the outcome is successful passage. Of course there are other nuances. The ‘head-games’ for one, but that is another story. I have always found my movement on rock, more mechanical than intuitive, more levers and strength, more straight-on plain – pull-down, reach-up, grab-hold, step-up, pull-down… that natural flow I see in others, is at times, forced. I put this mechanical anatomical monotony down to weight training and gymnastics from early years combined with being a late comer to climbing. 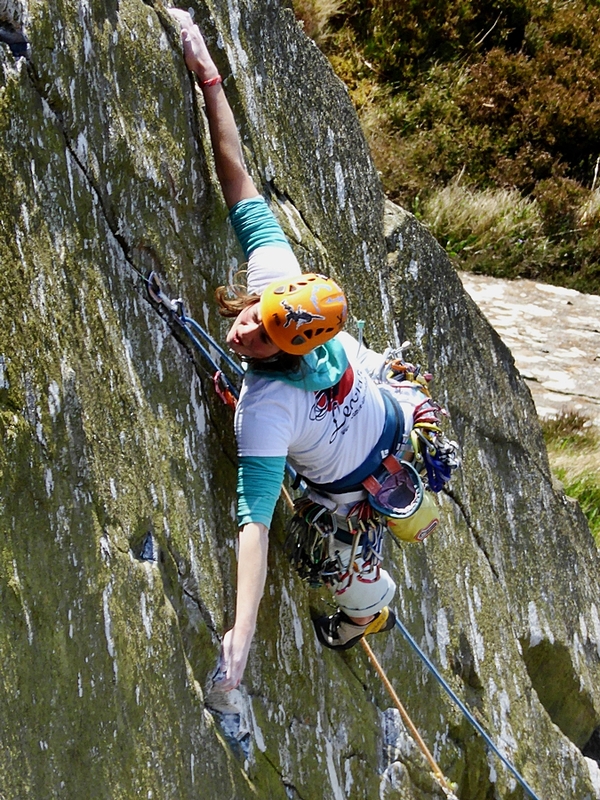 I can almost remember the few occasions over the last twenty years I have completely entered into a state of natural flowing progression on climbs at the top of my ability. A state where I do not have to stop and think, I do not have to move-up, climb-down, move-up, climb-down. And it is these times that have been the most rewarding. There is another factor to my mechanical and this is the self-taught, no climbing wall factor. 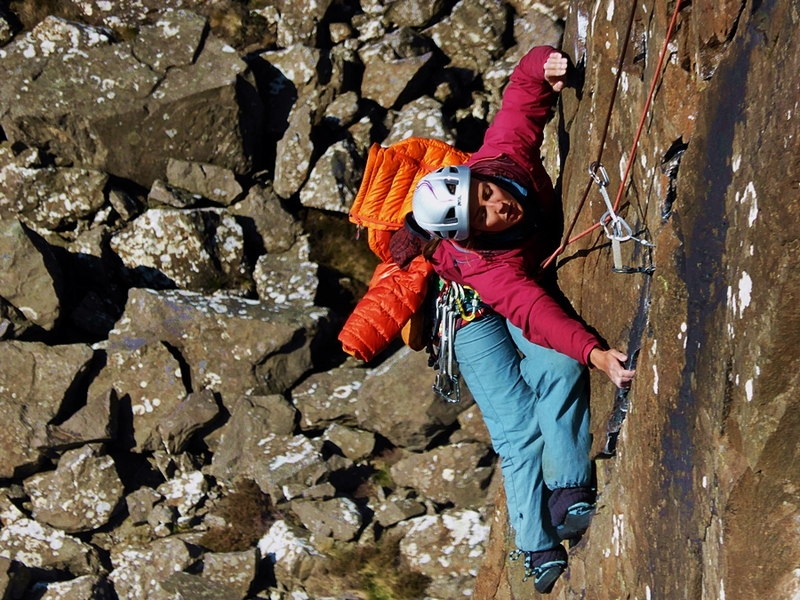 Approximately at the age of thirty, when I began to climb I did not have a local climbing wall or a climbing partner, so I took myself away and on-sight soloed routes. 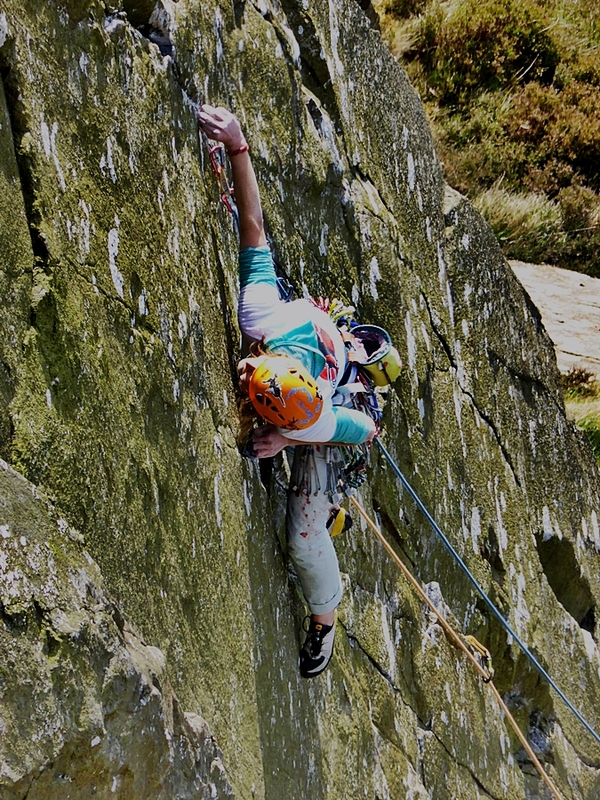 At that time, climbing routes was what rock climbing was about. I didn’t watch others or experience steep ground in the safe environment of a climbing wall. There was no drop-knee, flag, twist, gaston, heel-hook, knee-bar. I didn’t learn subtle movement while bouldering and I did not learn to pull really hard or push down and continue pushing down when the shoulder reaches the same height as hand. I did not learn to rock-over with the bodyweight directly above a toe or heal or to turn a knee inside or out. I did not appreciate the footwork is as important as the handhold. Only recently, twenty-two years down the line have I begun to learn the art of really seeing a hold and using it in the best available manner. Only recently have I begun to grip a hold and really bloody hold it. Trying exceptionally hard when rock climbing is not so natural, years of teetering above marginal protection have installed caution and shoulders, strong from weight training, have given me the ability to reach, teeter, reach, inch, inch and finally at full stretch, pinch. You would think this has brought about a mind-set to not let go and really fight, but it has possibly produced the opposite, when that extra inch of effort is required, something slightly extraordinary, I can’t see it, it feels impossible, unless practiced first, like a gymnastic movement and so falling is often the outcome. I have taught my body to climb on rock successfully at a standard, but seldom push into a higher level, a level incorporating specific skills. Trying hard also brings failure and for a lot of my climbing, failure spells serious injury or the feeling of, well, the feeling of failure, and this brings about other aspects of climbing from my earlier years that have also affected performance, which is this fear of failure, or at least the fear of being seen failing, which I suppose is about ego and acceptance and wanting to feel good about yourself. Over the last couple of years I’ve often heard this, because of course I have, I’ve become older and a tad wiser for sure. 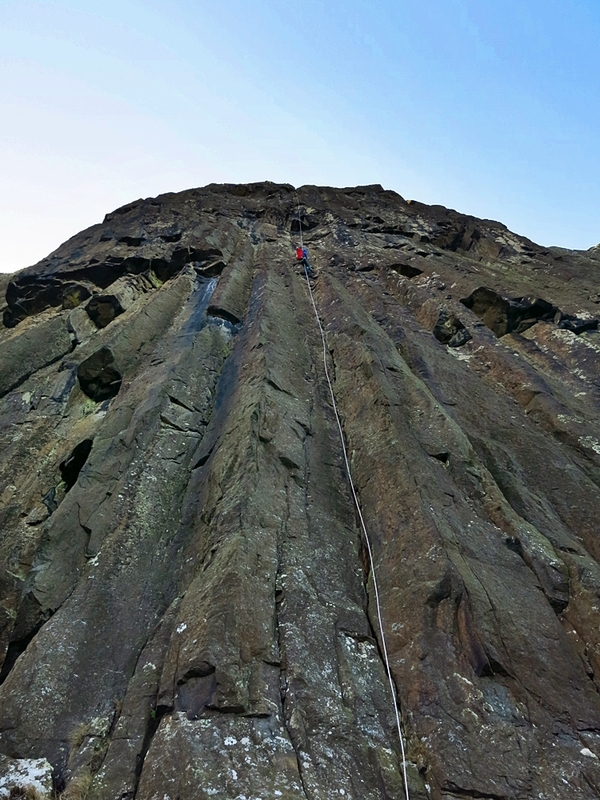 Since beginning to rock climb, I’ve shuffled, crawled, crept, minced and on those marginal weather days, I’ve hunted dry rock and when dry rock could not be found, I’ve slithered. But over the last couple of years, with a massive amount of climbing logged, instead of scratting on marginal days, I’ve started to train and boulder with specific goals and in doing so, when returning outdoors, I have, for the first time, actually gripped like I mean it and when the climbing becomes difficult my brain has at last realised you have to try really hard and definitely concentrate on weighting that foothold. Fortunately I now feel OK about myself and I don’t need to prove anything to anyone. Some of this I’m sure is brought about by experiencing so much, but it is also about growing up and growing older and realising I’m human, just the same as everyone else… I flail, fail, fall, trip and at times my mind questions and becomes scared but the ability to push on is still there, but it is more about confidence now in new found fitness and skills and less about trying to prove myself to myself and to others. Yes I’ve changed; I’m older and happier and more content and certainly climbing rock better than ever. Lolo,The Belgian, approaching the crux of Maiden Voyage. Lolo on the crux of Maiden Voyage. 10 out of 10 for effort and persistence and trying over and above what you think is possible. 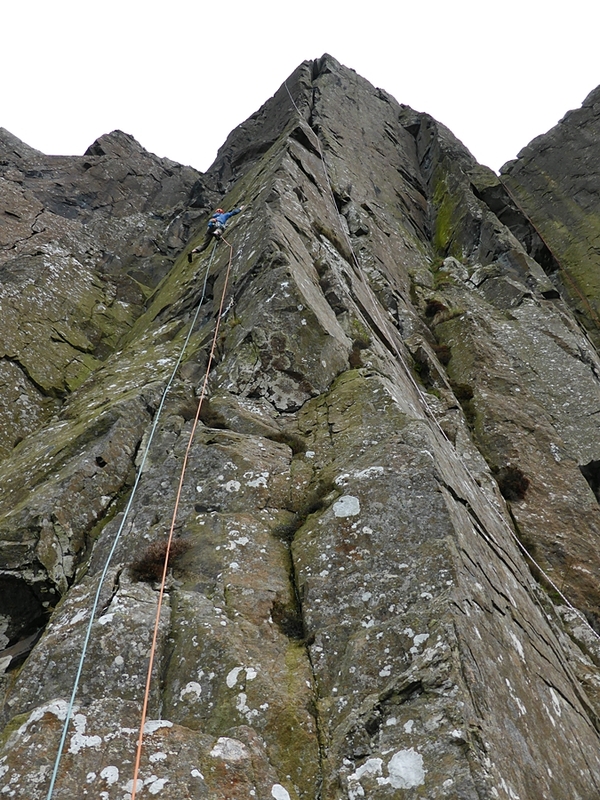 Myself on Hells Kitchen Arête. 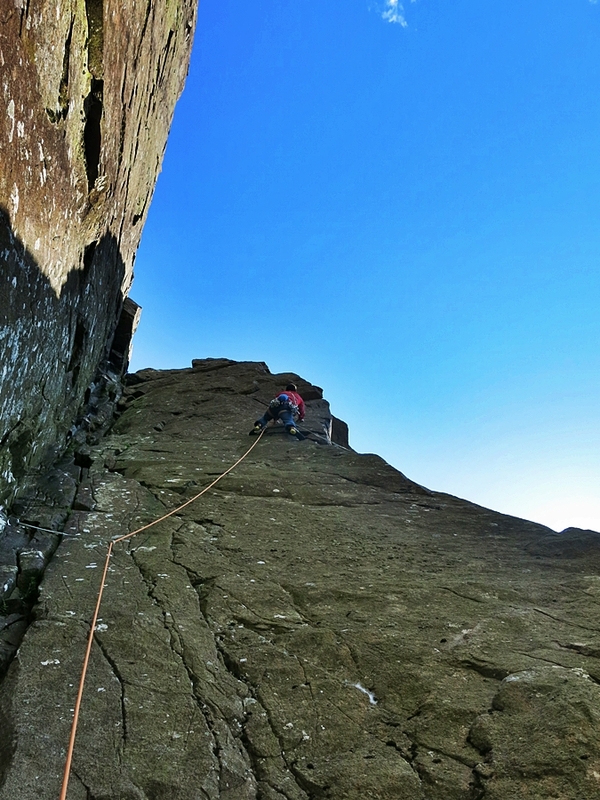 The first of the three routes I really wanted to climb this year at Fair Head. Pic credit, John Orr. 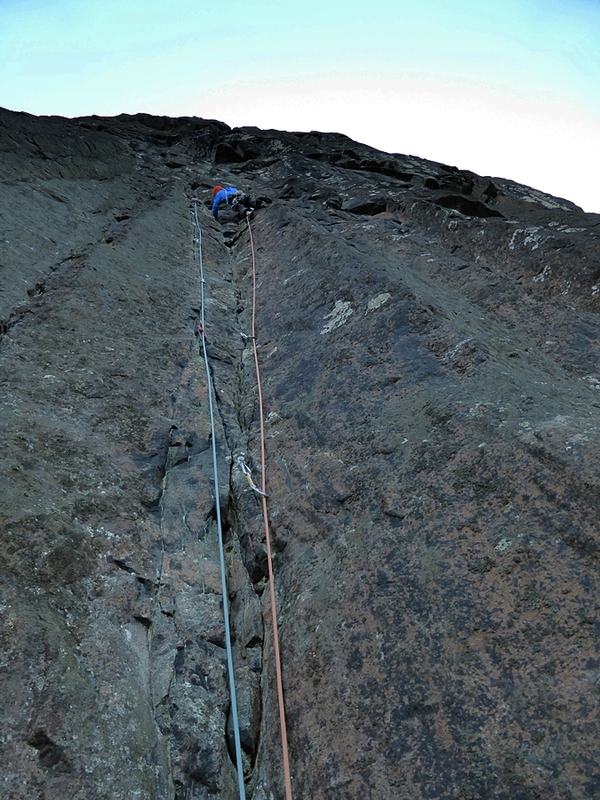 Myself on Hells Kitchen Arête. Pic credit, Mike Hutton. The main event of the week. 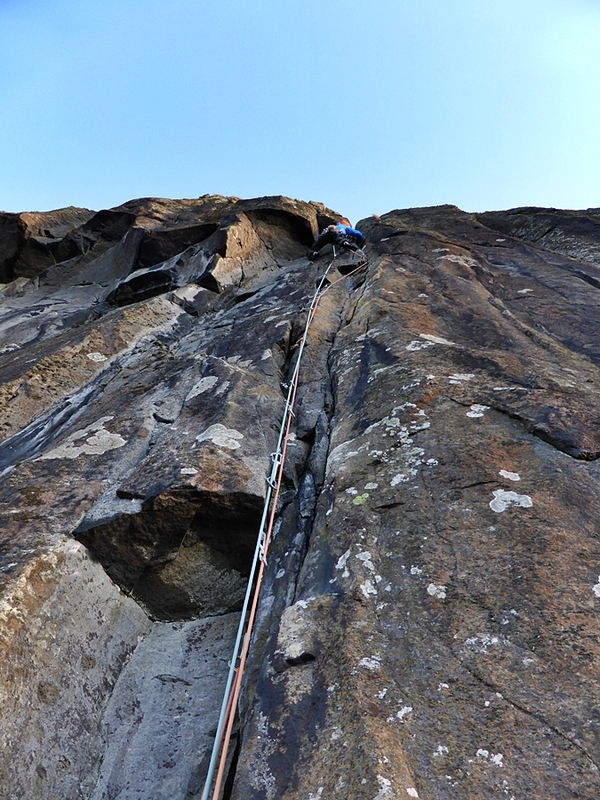 A four pitch beast which required a whole load of skills to get-up clean on a bloody cold day. 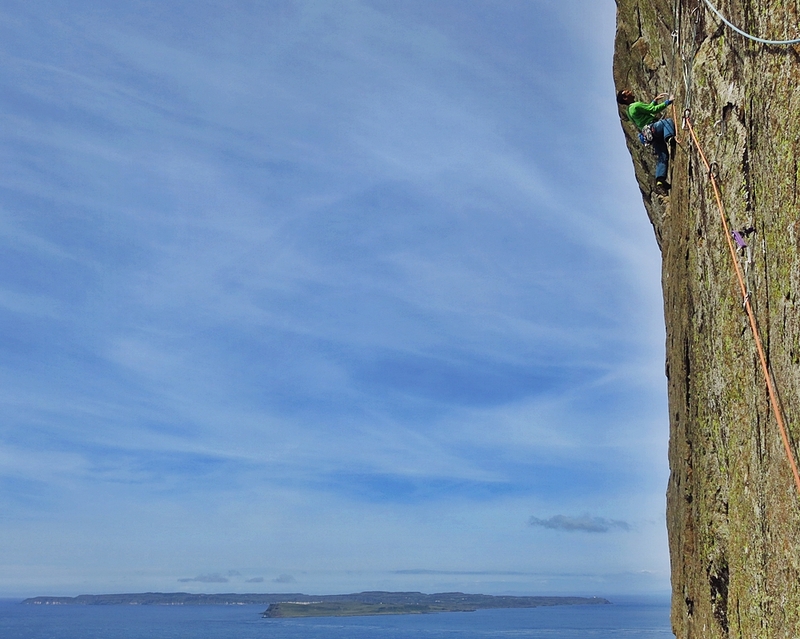 This was the climb of the week and deserves to be up there with the very best. Technical, strenuous, sustained, magnificent. 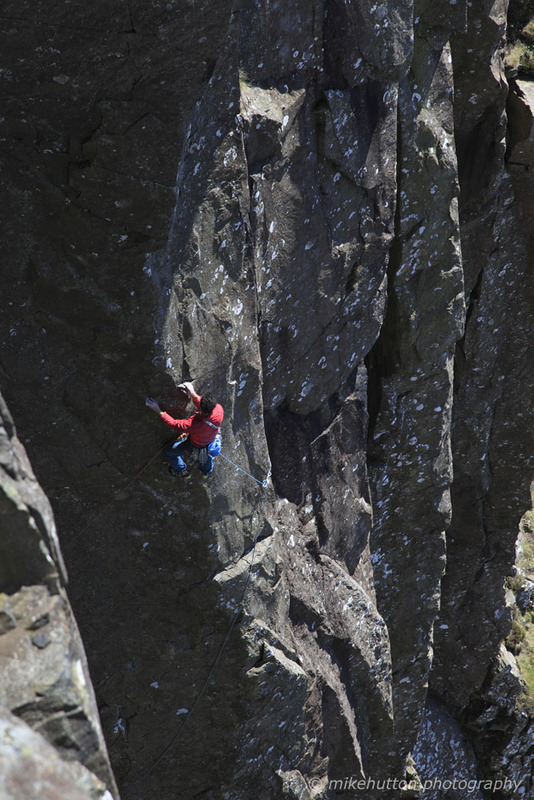 The second ascent. Well done to John and Paul for putting this one up. 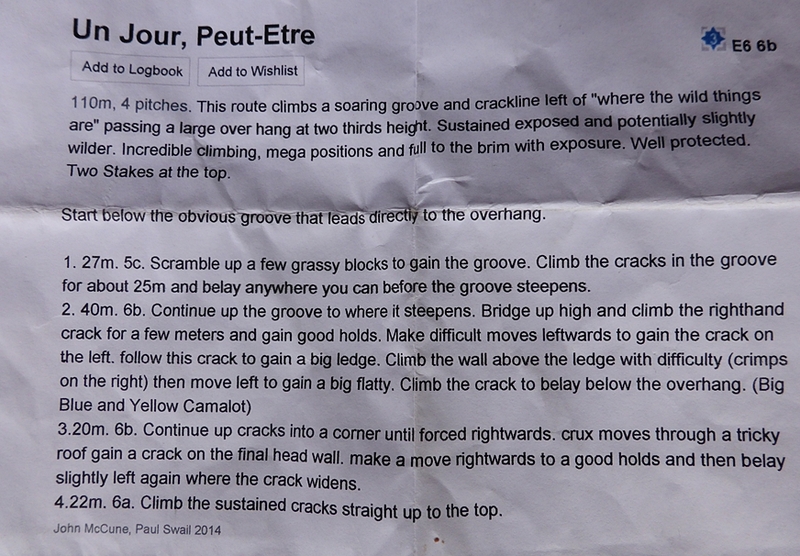 Abseiling into Un-Jour-Peut-Etre. Pic Credit, John Orr. 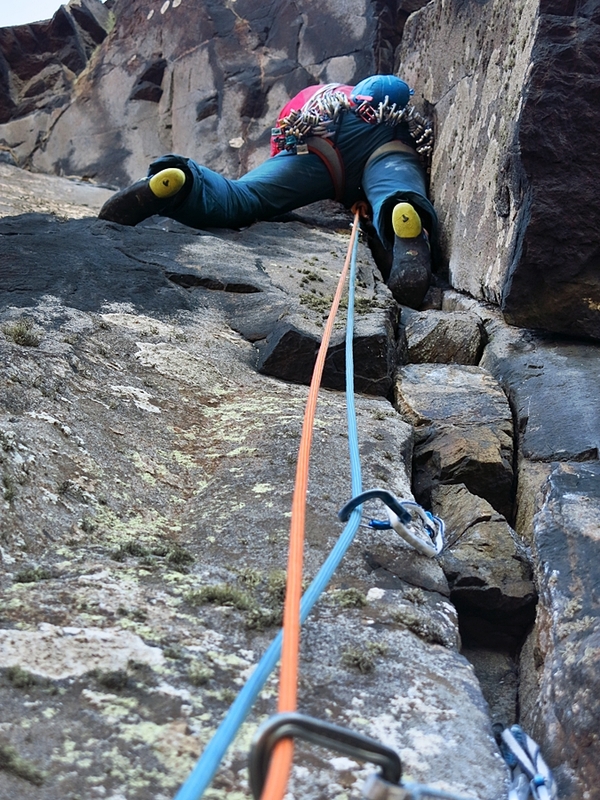 Myself on the first ‘easy’ pitch. Pic credit, John Orr. 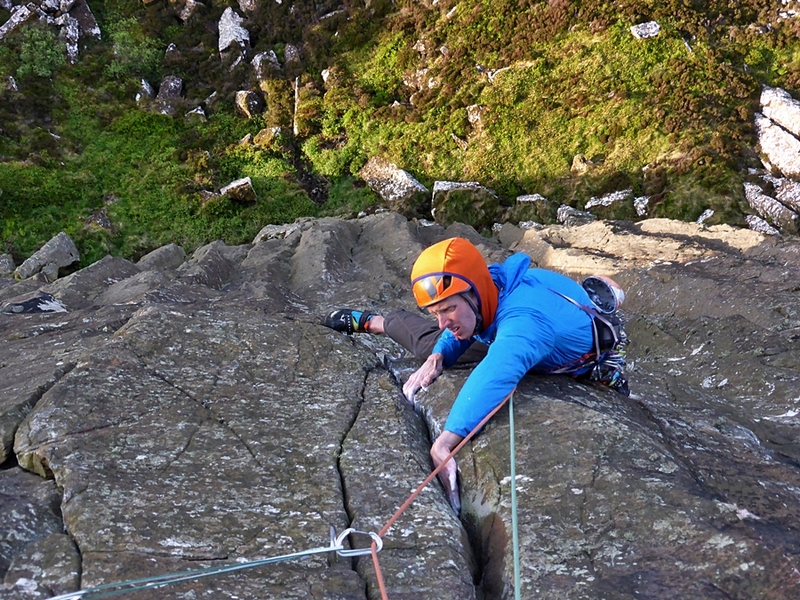 John Orr on the second pitch of Un-Jour-Peut-Etre. 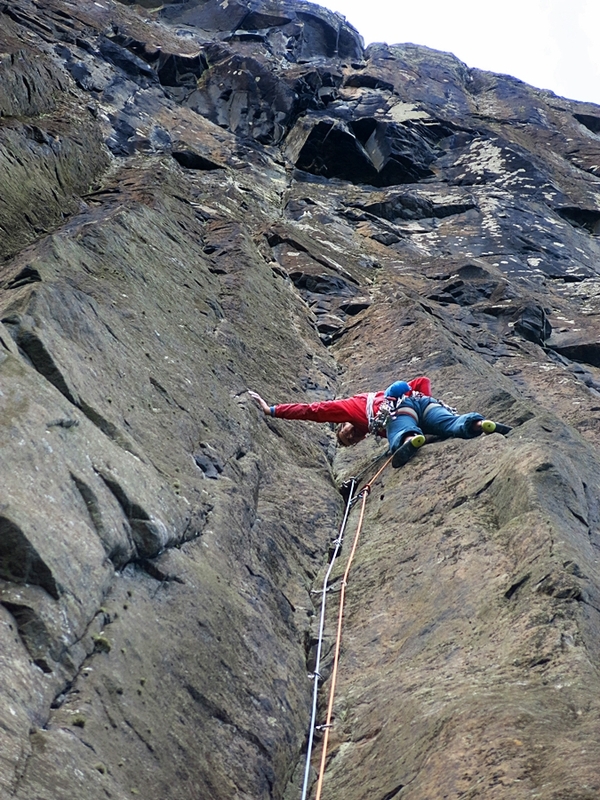 John Orr having pulled out of the overhanging of the third pitch of Un-Jour-Peut-Etre. 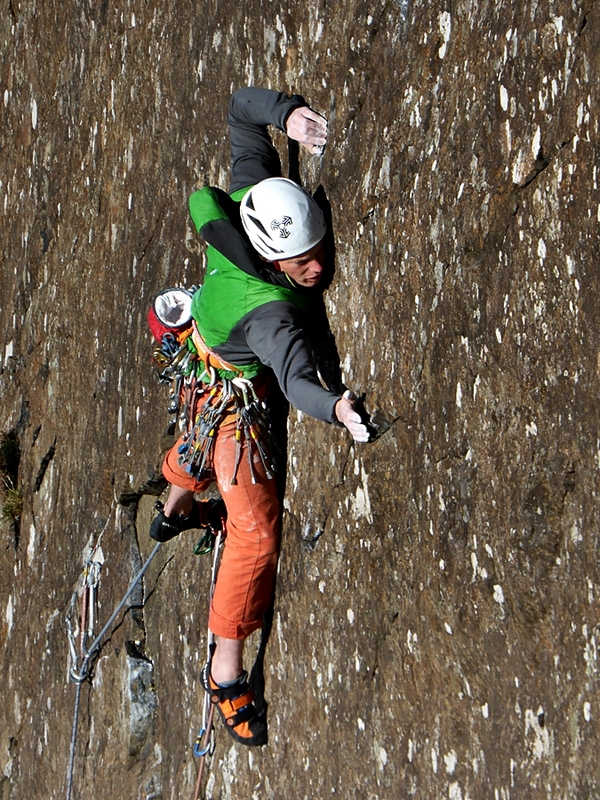 John Orr on the fourth pitch of Un-Jour-Peut-Etre. Don’t be fooled by the 6a grade, it ain’t over until the fat lady sings! Heather Florence proving that starting young helps while smoothly seconding The Mask. An old dog incorporating some new skills. On-sighting the Pat Littlejohn and Eddy Cooper uber classic, Above and Beyond. Pic credit, John Orr. More proof that its good to start young. Tom Livingstone on the crux of Primal Scream. Cheers to John Orr for a great trip and use of the pics. A great piece Nick. Having been climbing for over 40 years my wife says of me “How come you’ve been doing it so long and not got any better”- damning stuff. My reply usually includes a scrapyard of excuses but the truth is I never learnt the art of natural movement. When is an old dog beyond learning new tricks? I suppose it depends on the dog treat on offer. I’d better start practising. Fantastic pics Nick (& John). You guys had a ball up there! You’s stayed on into the week? Best thing that ever happened to me was realizing I don’t have to prove anything to anyone. Now its just fun and trying hard, all the time.